Snorkelling Port Douglas… Sailaway owner/operator Steve Edmondson’s relentless commitment for environmental sustainability and eco tourism caught the attention of journalists at one of Australia’s leading travel magazines; Travelling in Australia. Go Green! Save the Turtles bag artwork created by Low Island caretaker, Jenni Fox and sponsored by Sailaway to increase awareness of environmental best practices and assist funding of other educational materials i.e. information leaflets and interpretive centre on island near lighthouse. These medium sized durable, reusable bags are made of strong beautiful natural calico material and bags printed with “Save the turtles” artwork with Sailaway logo and message, proudly supporting Low Isles and turtle sustainability. 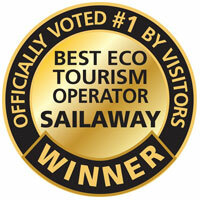 Go Green – Go Sailaway! Available only at the Sailaway Reef & Island Tours Marina base $7.50, plan to pick up one when checking in for boarding passes 30 mins prior to departure and perfect to use on Low Island and back home. Sailaway’s luxury Lagoon 500 Catamarans sail primarily with wind power. Our tenders use bio-diesel with low emission 4 stroke outboards. We contribute $10.00 from each and every passenger ticket towards sustainable reforestation & carbon offsetting programs that protect Low Isles and our neighbouring World Heritage Rainforests. We also talk to our guests and educate them about the servious environmental issues and challenges facing Sailaway’s favourite natural wonders including Low Isles, The Great Barrier Reef, World Heritage listed Wet Tropics Rainforests. Raising your awareness & appreciation of our pristine natural environment is an essential part of our carbon footprint reduction strategies. We provide bins to recycle plastics, paper, cardboard, aluminium/steel and glass used on-board Sailaway. Our on-board toilets are kept clean and hygenic using the Sani-Loo waste water treatment system. All food and produce served on-board is locally sourced and prepared fresh in Port Douglas daily by our friends at Port Douglas catering.